If I had to start off school, college or high school, with only five makeup products these would be my first choices. First for me I am always worried about my complexion, so a good full-coverage concealer, for any blemishes and my horrible under eye circles. Aldo along with my complexion I need a good foundation, I love NARS sheer matte, especially for summer and fall when my skin is more oily! It gives a very medium coverage when built up, but can also give a very light coverage if sheered out. I could live without blush, but I couldn't live without a good bronzer, and I solely use this for contouring, it defines my white face, making me look sharp and alive! Next I would need something for my big baby blues... MY EYES! I think I could live with a great defining and voluminous mascara like Bad Gal and a simple multi-purpose palette like Smashbox's softbox palette. A little eye shadow and bit of mascara goes a long way to defining your eyes! 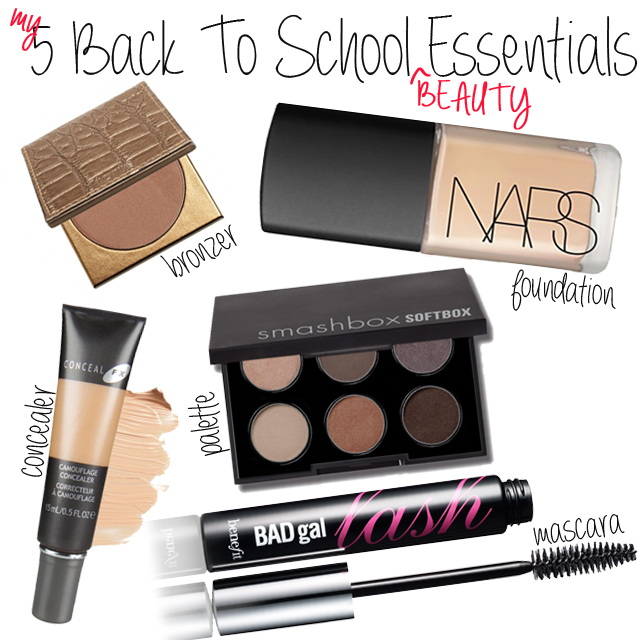 What is your number one beauty back to school essential??! I really want to try a NARS foundation and the concealer sounds like something I need in life too!